As a graduate student studying Bermuda’s seaweed biodiversity, I had the good fortune of spending a year in the islands, collecting thousands of macroalgal specimens for the Bermuda Seaweed Project with support from NSF Award No. 1120652. While diving Bermuda’s spectacular reefs on the hunt for new and interesting species of algae was the primary focus of our work, my colleagues and I were eager to share our enthusiasm for these beautiful and vital organisms with the Bermudian community— especially its students. For those who aren’t in the know, algae are commonly misconceived as being ‘green’ (some are, but not most!) or ‘pond scum’ (most algae live in the sea, not fresh water) or ‘stinky’ (most only smell bad when they are dead). Another misconception is that seaweeds are mainly a nuisance— mucking up beaches and overgrowing the more charismatic organisms on a reef— like corals. But to the contrary, macroalgae create essential habitats for juvenile marine animals, in addition to being important primary producers. They also provide terrestrial beasts (humans) with a multi-billion dollar industry tied to health and medicine, food production, and cosmetics. Seaweeds exhibit a staggering diversity of sizes, shapes, colors, textures and habitats, and the exquisiteness of some is an inspiration to biologists and artists alike. For all these reasons, we find it quite satisfying to share our knowledge of and affection for these underappreciated organisms by creating opportunities for education and outreach. My work in Bermuda inspired several formal education/outreach activities, which I will describe below, as well as countless informal occasions where I’d like to think my interest in algae gave my peers a fresh perspective on this diverse and important group of marine organisms. 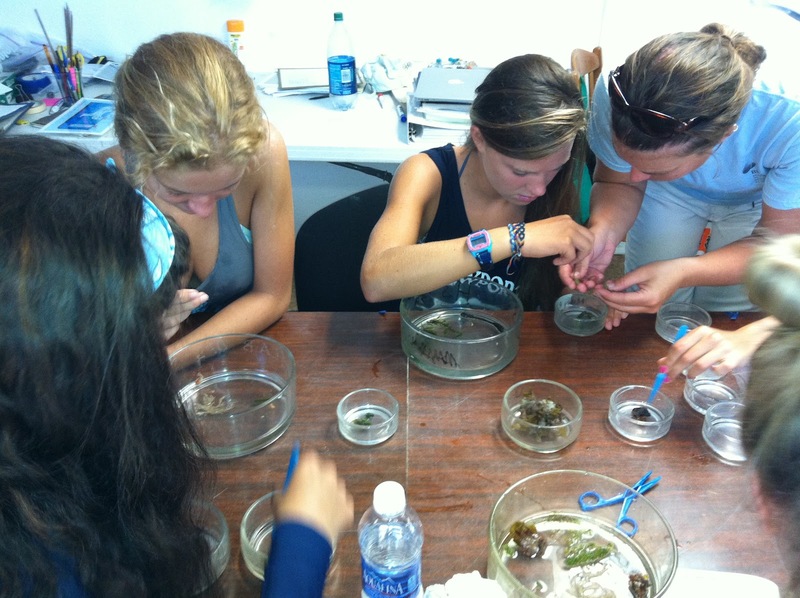 In July and August of 2012, I was a guest educator for the Bermuda Institute of Ocean Science (BIOS) Ocean Academy Marine Science Internship. This program serves students ages 16 to 18, and focuses on getting kids involved in scientific diving. Education Coordinator Kaitlin Baird and I developed a workshop for student interns that included a reef macroalgae scavenger hunt (via scuba). 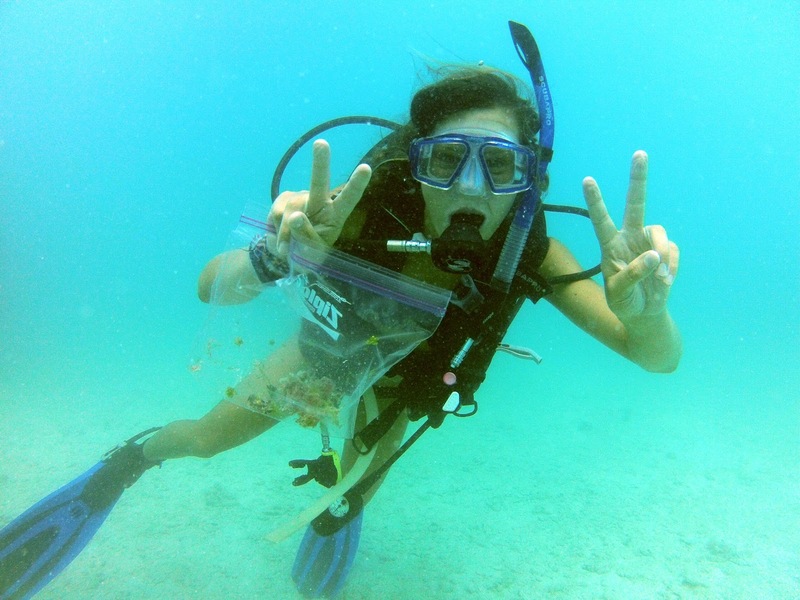 BIOS Ocean Academy student intern collecting algae via scuba! 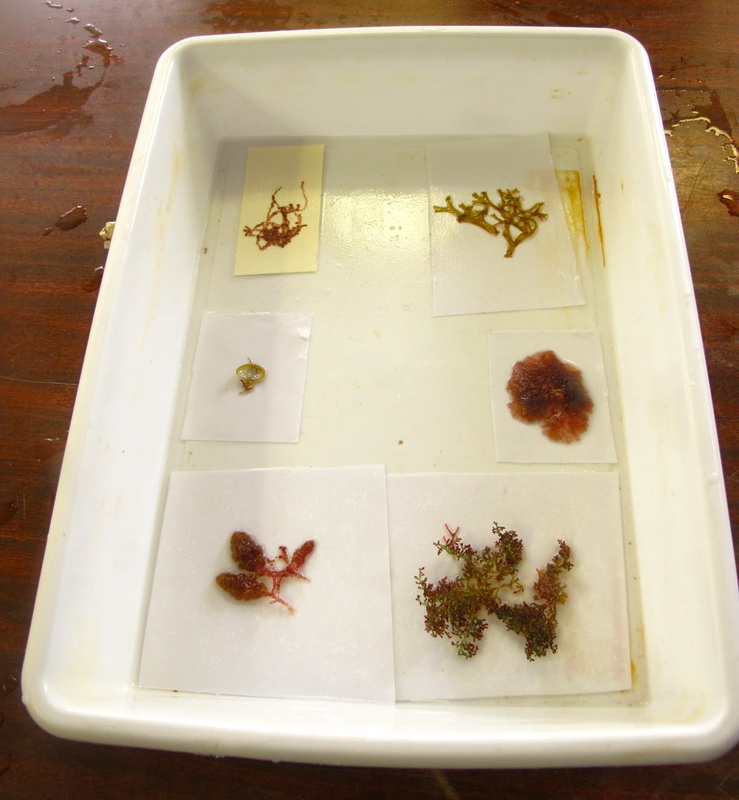 Later I provided guidance to students as they identified specimens, and taught them how to float and press algae to create herbarium records for their collections. 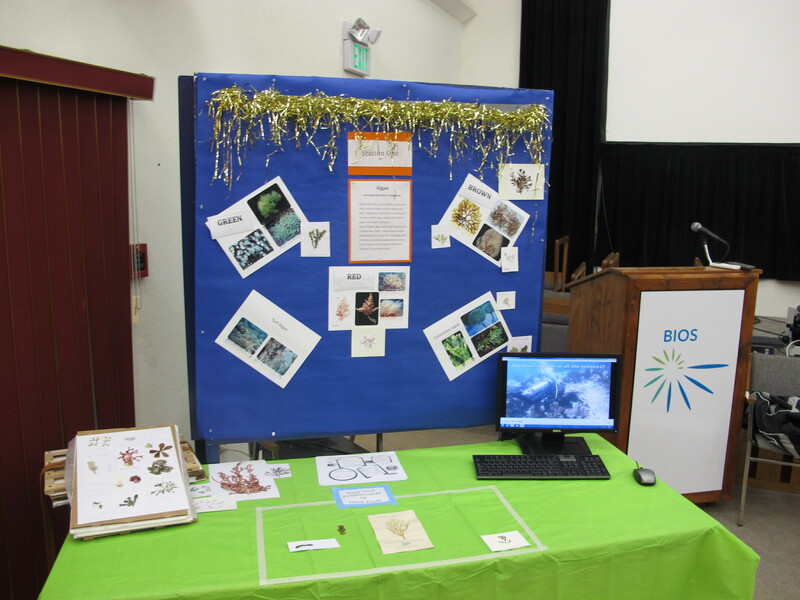 Each year, BIOS hosts an island-wide community event, Marine Science Day, where BIOS research is showcased for the public. Islanders of all ages can view featured presentations, participate in marine-science related activities, and talk to scientists about their work. 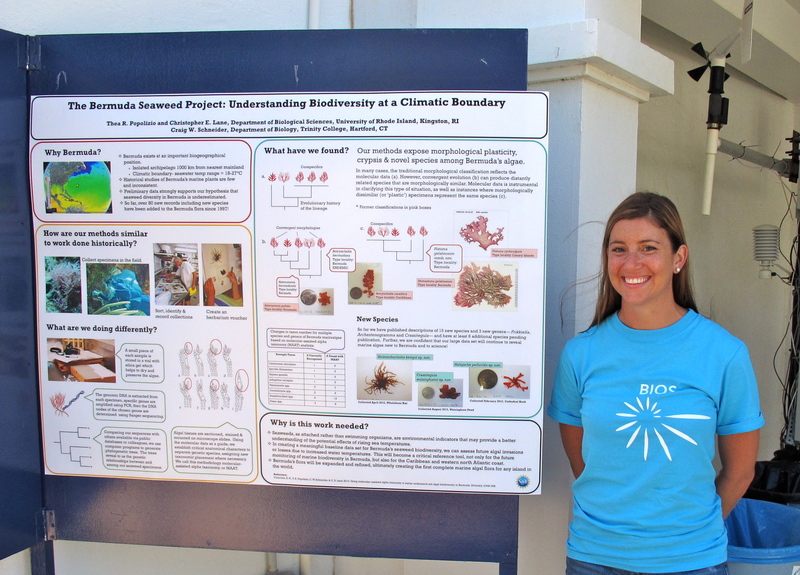 I participated in the September 2012 event by sharing an overview of my work in a poster presentation, accompanied by a ‘touch tank’ of some of Bermuda’s most common red, green and brown algae. 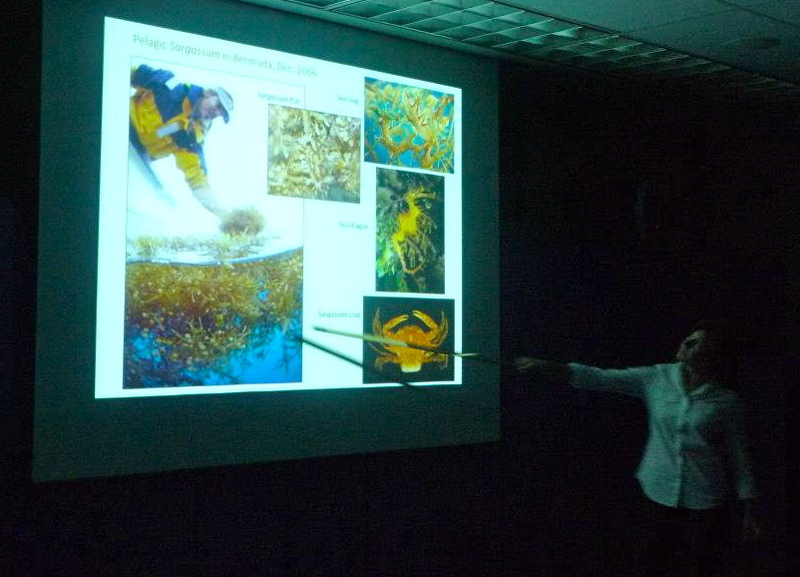 In December 2012, toward the culmination of my field year in Bermuda, I presented my work to a public audience via the Bermuda Aquarium Museum and Zoo’s Lecture Series. I spoke about the biology and evolution of macroalgae, as well as its importance in the ecosystem, and explained the significance of my research project in the islands with some major findings to date. Early this year, BIOS conducted their annual Explorer Program— this year’s was ‘Expedition Sargasso,’ and focused on the biology, chemistry and physics of the Sargasso Sea. About a thousand of Bermuda’s primary school students (ages 8-12) visited the event. Students learned about what algae is, how it is found, identified and pressed. A main highlight was the brown algae of the genus Sargassum. Students spent time trying to separate out some of the most common species of Sargassum in Bermuda using a dissecting scope. They went on to learn about the wealth of life that calls this seaweed home, along with the movement of the beds within the North Atlantic Gyre, and more specifically the Sargasso Sea. 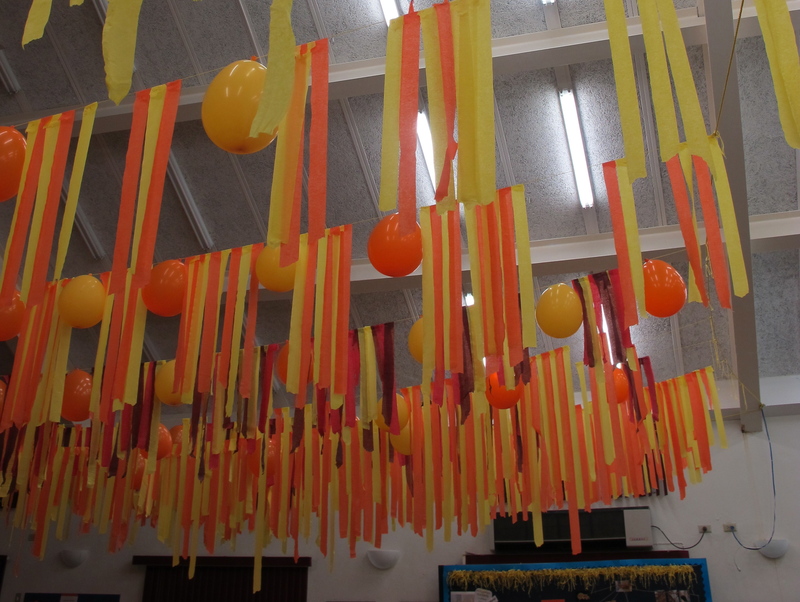 The event took place under an artful representation of a Sargassum bed. Educators transformed the ceiling of the exhibit space into a floating Sargassum bed, and showcased an algae station where students and teachers could learn about the three major groups of seaweeds, look at herbarium specimens of a variety of Bermuda’s algal species, and watch a video of our team diving for algae on the reef. Seaweed table with looping video of our team collecting algae while diving! You can watch the hunt here! Video | This entry was posted in Uncategorized and tagged algae, education outreach, seaweed. Bookmark the permalink. Microdissection with frikin laser beams!